The Ricci are an ancient family in Tuscany. Catherine was born at Florence in 1522, and called at her baptism Alexandrina, but she took the name of Catherine at her religious profession. Having lost her mother in her infancy, her father placed her in the Convent of Monticelli, near the gates of Florence, where her aunt, Louisa de Ricci, was a nun when she was between the age of six and seven. To her, this place was a paradise, but after some years her father took her home. Attracted to the religious life, and with the consent of her father, she received the religious veil in the convent of Dominicanesses at Prat, in Tuscany in the year 1535 at fourteen years of age. The saint was chosen, when very young, first as mistress of the novices, then sub-prioress, and, in the twenty-fifth year of her age, was appointed as perpetual prioress. The reputation of her extraordinary sanctity and prudence drew her many visits from a great number of bishops, princes, and cardinals-among them, the Cardinals Cervini, Alexander of Medicis, and Aldobrandini, who all three were afterwards raised to St. Peter's chair, under the names of Marcellus II, Clement VIII, and Leo XI. 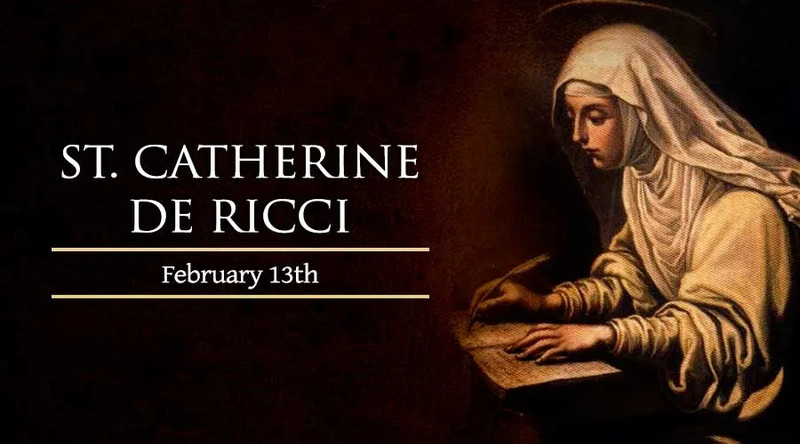 Most wonderful were the raptures of St. Catherine in meditating on the passion of Christ, which was her daily exercise, but to which she totally devoted herself every week from Thursday noon to three o'clock in the afternoon on Friday. After a long illness she passed from this mortal life to everlasting bliss and possession of the object of all her desires on the feast of the Purification of our Lady, on the 2nd of February, in 1589, the sixty-seventh year of her age. The ceremony of her beatification was performed by Clement XII in 1732, and that of her canonization by Benedict XIV in 1746.